The Kernels Party Plaza area is located down the right field line, on the concourse above the Plaza bleacher seating. The Party Plaza is another great all-you-can-eat-and-drink option for smaller groups. The area requires a minimum of 15 people to book, and can hold a max of 150 people. The area is usually split into five sections and can be rented out to five different groups, or to one or two large groups, depending on size. The entire Party Plaza is covered and provides protection from rain and sun, and seating in the area is banquet-style with tables and chairs, as opposed to picnic-table seating. The Closer ($28 per person) - ticket and unlimited food and beverage. 1/3 lb. juicy hamburgers* & cheeseburgers, hot dogs, brats, popcorn, peanuts, choice of dessert, soda, bottled water and beer. Food and beverage is available for three hours starting 30 minutes prior to the scheduled game start time. 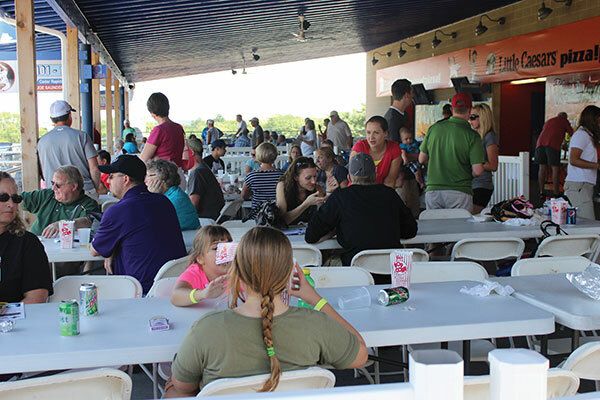 Contact Andrea Brommelkamp at (319) 896-7603 (andrea@kernels.com) or Peter Keleher at (319) 896-7622 (peter@kernels.com) if you are interested in booking the Kernels Party Plaza for the upcoming season!